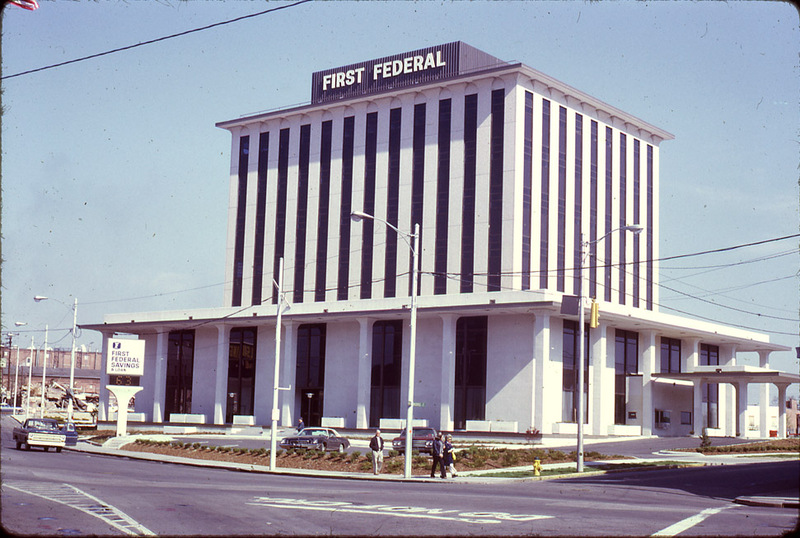 The First Federal Savings building was constructed in 1974 on a city block that had been razed via urban renewal. This block was built up over the course of the early 20th century, evolving from an 'accessory industrial' and residential area to a retail area during the 1920s. Remnants of the residential form are still evident in the picture below, which shows several houses and the Congregational Church located along the west side of Morris Street. 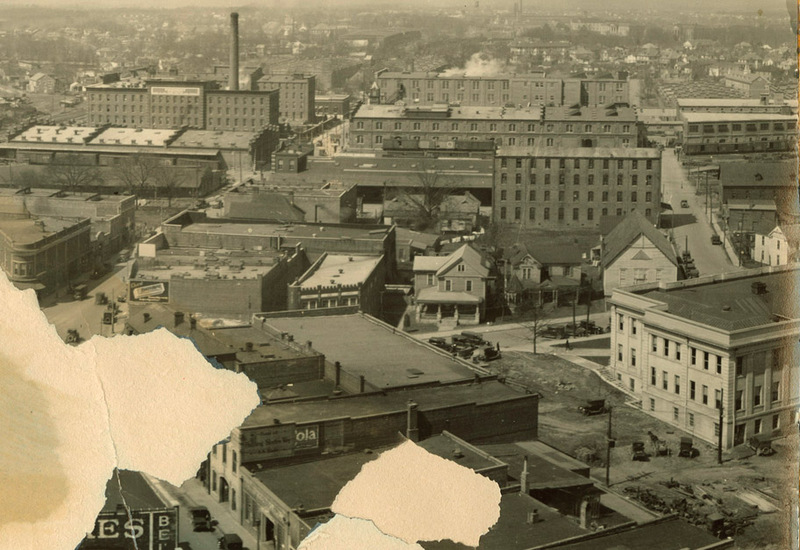 The mostly residential west side of Morris St. can be seen in this 1924 photo, with the crenelations atop the Salvation Army building poking above the east side structures. 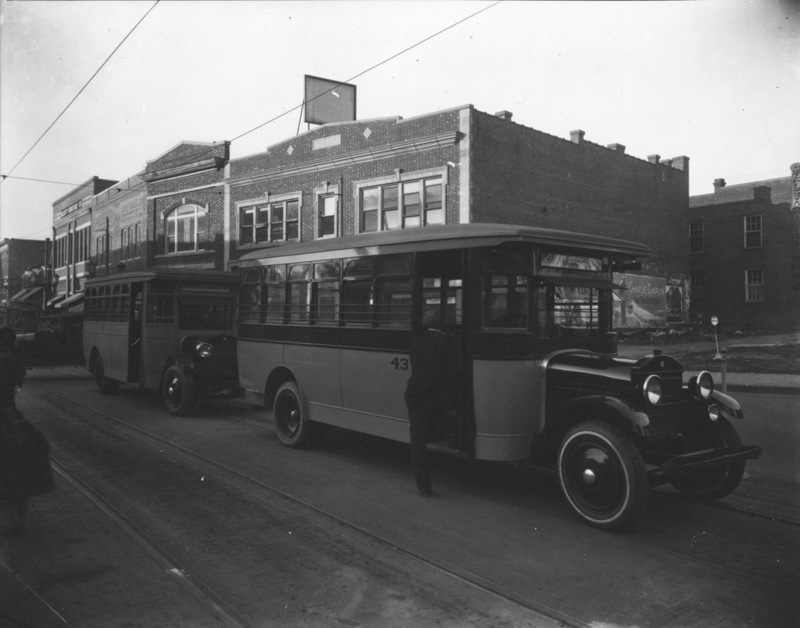 A view from the 1920s, looking northwest. looking west up Main St.
Another view of the West Main Street frontage, looking northwest, from the 1950s. The photographer is ~50 feet west of Five Points. The house remaining in the middle of the block of commercial structures in the 'streetcar picture' above has been replaced with the Colonial Stores building. An early color picture of this block, taken during the Durham centennial parade in 1953. The other side of the block, facing Morgan Street, also developed as a light industrial / retail corridor during the early 20th century, retaining a bit more industrial feel. 501 Morgan, (at the corner of Morgan and Morris) with the Jones Warehouse in the background, during a city sanitation worker strike, 02.16.48. 501-509 Morgan, 09.18.52. This picture is looking south from the north side of Morgan St.
501 Morgan - the southeast corner of Morgan and Morris. The Piedmont (flatiron) Building and Snow Building are visible in the background at Five Points. The modernist structure at 301 West Main is under construction and a partial shot of City Hall (now the Arts Council) is to the left. In 1972, this entire block (between West Main, Morris, Great Jones, and Morgan) was demolished by the city using urban renewal funds. 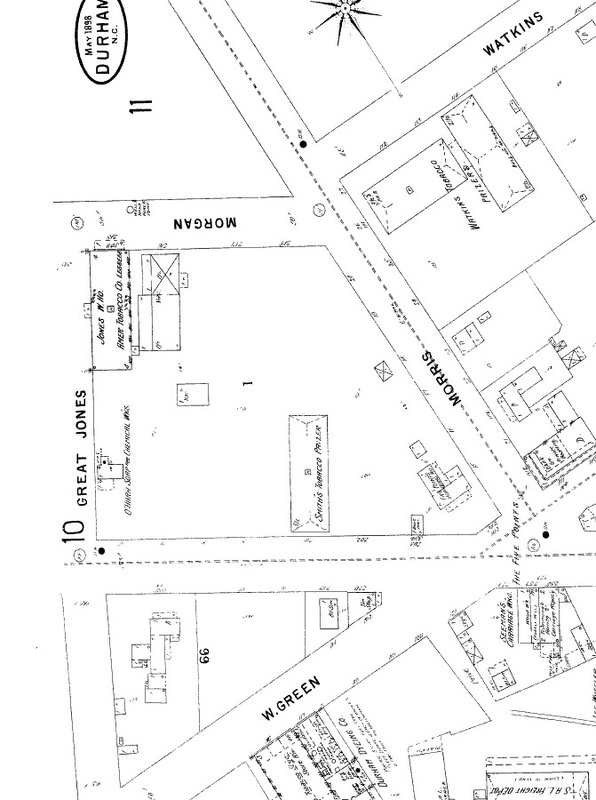 All of the parcels in the block bounded by Morris, West Main, Morgan, and Great Jones, and became the site of the new First Federal Building. 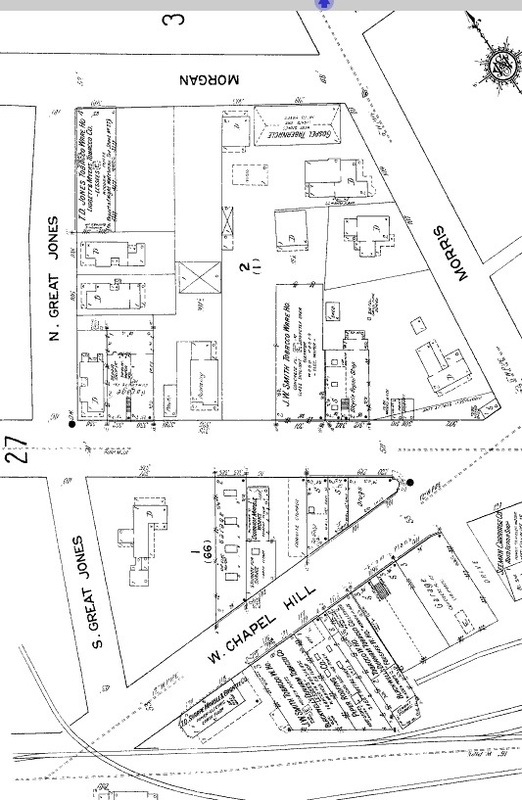 As you can see, First Federal had previously been located across West Main Street. First Federal eventually gave way to SouthBank, which owned the buiding up until it was purchased by Greenfire Development - in, I believe, 2007. Here is the building in 2006. Looking east from Great Jones, 2006. It is hard to overstate how this building dominates the landscape at Five Points. While its height is certainly out of scale with any older structures at Five Points, the setback, lack of street orientation, unclear entrance, sea of parking, dominating lower floors... everything about this building sneers at the pedestrian. The sense of being 'pulled back' from the streetscape (and thus humans) is clear in the comparison aerials below, 1959 vs. 2010. You can get a sense of the diversity of buildings/architecture in this area and how they related to the street in the 1920s. While I'm not a fan of this building architecturally, regardless of location, I actively loathe this building at this particular location. It would help to fill in some of that parking lot with some buildings that had normal street frontage on Main Street. It might soften this hulking fortress a bit. I'm sure that when this building was constructed, city leaders were thrilled that a bank was going to keep its main building in downtown Durham, and would have allowed anything to be demolished or built in order to get that to happen. Unfortunately, on this front, things haven't changed all that much. What wouldn't Durham allow to be demolished if Bank of America or a similar company wanted to put their world headquarters in downtown Durham? Would anything be sacred? From the north side of Morgan, facing south, 2007.